August: Khaadi, Pakistan’s premier fashion retail brand moved its store to the iconic Dolphin Chowk in the New Mirpur City today. The decision to relocate was taken to provide its customers a bigger store focusing on design and offering its clients an unforgettable shopping experience. Located at the Dolphin Chowk, Khaadi’s new store, spread over 13,477 square feet of retail space, will create jobs for approximately 18 employees in New Mirpur City. 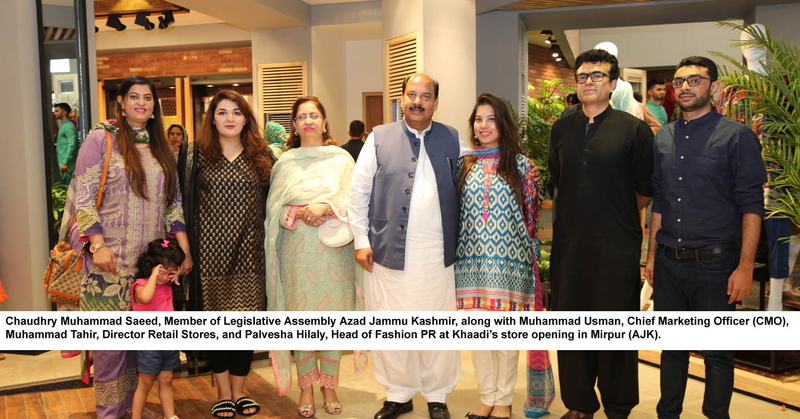 The launch event held at the store was attended by the Minister of AJK for Sports, Youth and Culture, MDA, MDHA & Mangla Dam Affairs, Chaudhry Muhammad Saeed along with his family and media personnel.